As the Zionist Movement developed, one of its secondary goals was to transform Jewish life by freeing it from what was considered a ghetto mentality, a societal mind-set of being weak and oppressed. For Max Nordau (1849-1923), a physician and author who was a co-founder of the World Zionist Organization, this meant moving away from bookish intellectualism and focusing on creating something he called “Muscular Judaism” (or, in his native German tongue, Muskel Judentum). Even in Nordau’s day there were Jewish men and women who excelled in athletics or served as soldiers in their nations’ armies. But he was also aware that the anti-Semitic press made a point to emphasize the Jewish characteristics of being bookish and physically weak. “Muscular Judaism” did not become a major movement in the Jewish world, but it did inspire many to get more involved in physical activity. 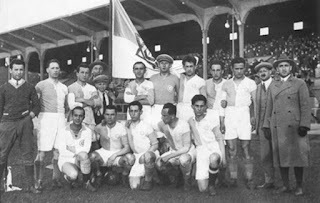 In Vienna, Austria, a Jewish sports club named Hakoach Vienna (The Strength of Vienna) became home to a championship soccer team that played in Austria’s 1st class division. They proudly donned blue and white uniforms and toured throughout Europe, England and the United States (where many players defected after being impressed with the lack of overt anti-Semitism). Hakoach Vienna had its own stadium and facilities for a wide range of sports. Its swimming pool was the training ground for record setting Austrian swimmer Judith Haspel, who chose to forego Olympic glory rather than compete in Munich. Hokoach was forced to close in 1938, when Austria came under Nazi control. After the war, it reopened briefly. Unfortunately, Max Nordau never saw the Zionist dream become a reality. One can thus only imagine how proud he would have felt about the fulfillment of his Muscular Judaism ideals in the Israeli army and the host of exceptional Jewish athletes competing throughout the world. Copyright © 2018 NJOP. All rights reserved.